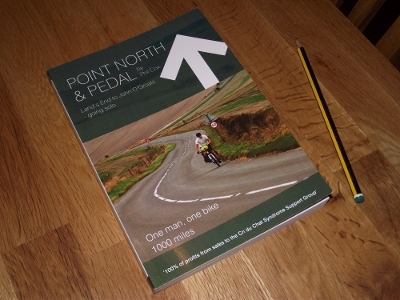 Home / Bike Training / Book Proof Arrives….! The last few days have dragged waiting for the proof of the book to arrive…it finally did yesterday. Despite having eagerly anticipating this moment for a long time, it was strangely flat. The book looked like a book: I did notice that the cover was a little flimsy at 250gsm (I have negotiated a free upgrade to 300gsm) and that there was a mistake on the contents page, it was not the momentous moment I thought it was going to be. However, it was nice to see all the work come together in one place, the cover art appeared so much better actually on a book instead of a .pdf on the screen. I like the design; it really gives a good representation of the content. The pictures in the book are a touch grainy but then none of them were taken with a decent camera (some with a different camera) and I suspect the paper used is not the same as if I had used a publisher and charged £12.99 for the book. In terms of corrections, I have started to proof read it (again) and have picked up a couple of semi-colons that should be commas and vice versa. The majority of the changes are around re-wording sentences. I am happy with 95% of it but there are still pieces that need attention. After this re-jig, that will be it – back to the printers as a signed off proof, this will mean amending the word document and resubmitting. Mark Crone at http://www.clearwatertraditionalmarketing.co.uk has produced a fantastic website; I am very grateful and have enjoyed working with him. He sent me over a test page which shows the book cover off nicely and gives people the opportunity to buy. I think this looks really nice, clean and easy to use. Check out his website if you get a few minutes spare. There is still a long way to go before the first box of books arrive for sale but I hope to have it ready for launch by the last week of April. I’ve come this far and don’t want to spoil things by rushing now. Now that year end has finished at work and I can start cycling again, I fully expect my mood to lift and everything to come right; happy and sunny days are on the way!